Maintaining entrepreneurial tenacity on the front lines of art creation, markets, and staying afloat with their business, artists need a big vision to stay dedicated to their occupation. Citizen Potawatomi Community Development Corporation (CPCDC), based in Shawnee, Okla., is helping Native artists in their local community stay dedicated through their Individual Development Account (IDA) program, which will match an artist’s savings 1:1. When artists have barely enough money to create art and get to market, it takes a leap of faith to begin setting aside money for investing in their business –– but knowing their investment will be doubled makes that leap much less intimidating. Funded by First Peoples Fund’s Indigenous Arts Ecology grant, CPCDC’s IDA program encourages artists to save by providing a $500 match when the artists reach their goal of saving $500. Of the eight artists currently enrolled in the IDA program, each artist is saving for items specific to their mediums, including things like a commercial sewing machine, recording equipment, computer software, and displays for art markets. Once they have these tools in place, they can move to the next phase of their business. Before enrolling in the IDA program, artists take the initial steps in learning how to plan their business by attending one of First Peoples Fund (FPF) Native Artist Professional Development (NAPD) trainings. 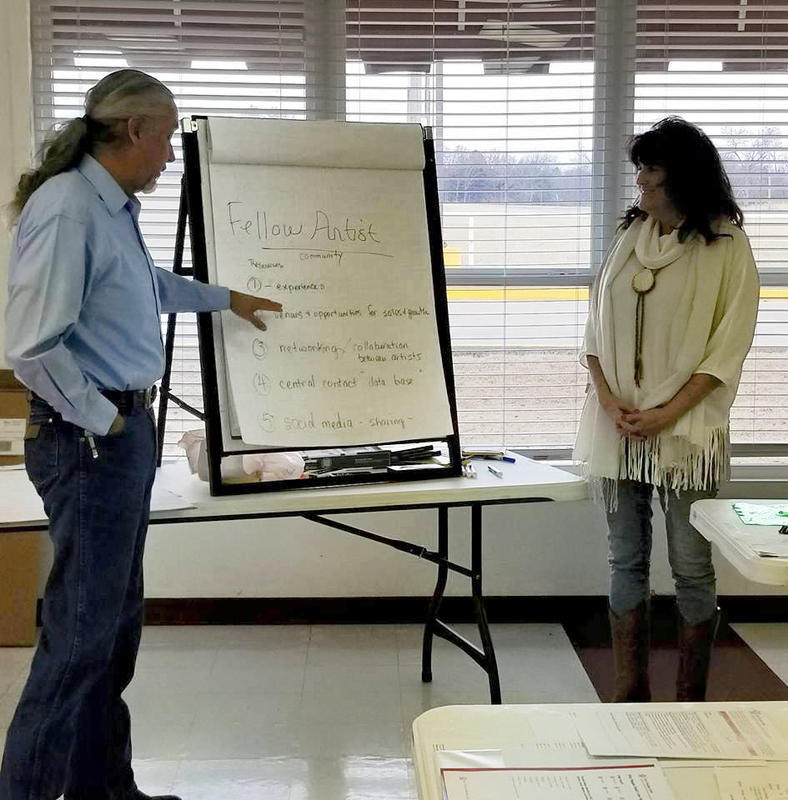 Charles Clark (Potawatomi) and 2016 FPF Artist in Business Leadership Fellow Leslie Deer (Muscogee), led three NAPD trainings in 2018. The trainings, hosted in Shawnee, Lawton and Tulsa, averaged 10-15 artists in attendance who received formal instruction through the values-based curriculum, complete with a workbook they could take home for future reference. As with any NAPD, not every artist who attends is at a point where they can implement all the elements referenced in the training, but it boosts their confidence in believing they can take their business to the next level. Once artists complete the training, they are offered the opportunity to enroll in an IDA program. This is a challenge for most of the artists — committing to invest funds they scarcely have. But the NAPD curriculum gives them confidence in their plan to earn back their investment. In an effort to plan their own path forward, Felecia and CPCDC artist advisor Amber DuBoise (Prairie Band Potawatomi, Sac and Fox, Navajo) attended FPF’s Indigenous Arts Ecology Grantee Convening earlier this year in Phoenix during the Heard Museum Art Market. Networking with the other Native CDFI grantees gave them ideas for how CPCDC could adapt the model for the artists they serve throughout Oklahoma. Inspired by Kawerak, Inc.’s Bering Strait Arts and Crafts Facebook group, CPCDC now has a Facebook page for artists in progress. The IAE convening also encouraged them to set up databases. Hired part-time through the IAE grant, Amber is creating spreadsheets to track market calendars, deadlines, entry fees, gallery options, and other resources to disseminate to artists. Their work spans a broad geographic area, impacting fifteen tribes throughout Oklahoma, so the databases will help keep track of all the moving pieces. As 2018 draws to a close, CPCDC is wrapping up trainings and looking ahead to their second year in the IAE program, including expanding their network. When Sandra Medrano of the Creative Circle Gift Shop and Gallery heard about the work CPCDC is doing with artists, she offered to host a training at their facility. The gallery is multicultural, opening a door not only for training but also for the Native artists who attend to potentially reach a new market with their work. Through training, one-on-one counseling, and networking, CPCDC is building a bridge for artists to walk across to achieve new possibilities and sustainability with their businesses.